There are many internally-rewarding aspects of being an artist and a graphic designer. First, there’s the joy that comes in creating — in putting paintbrush to canvas; in testing doodles on a Wacom tablet; in harnessing the power of white space. On another hand, there’s the thrill — those inevitable stomach flutters — of presenting a new brand to a company, organization, or group who’s ready to put visuals to their values. On yet another hand, there’s the surge of pride that comes knowing you’ve finished a creation — whether or not it’s for anyone other than yourself, and whether or not it’s perfect. Simply knowing that you’ve created can be all you need. These are not mutually exclusive — there are times when I’m astonished by the joy that comes in creation, filled up knowing that I’ve given a visual voice to companies with a brand presentation, and proud of what I’ve been able to complete. But of course, there are times you need more than the inner recognition. Times when you need just a bit of outside validation; times when a simple cheer from someone else can push you past a hurdle or up that mountain. At those times, I’m grateful for two other aspects of being an artist and graphic designer: partnership and recognition. Partnership is such an important piece of business. As a business owner, there is absolutely no way I could reach the milestones I set out for myself without the help and partnership of others. This starts with my clients. I’ve talked before about the importance of embodying your ideal client. Another way to get more in tune with them is simple: Surround yourself with them. My ideal client is a traveler; someone who knows what it’s like to have a heart filled with wanderlust. Someone who knows how important it is to create a customer experience that people want to write home about, even in these days of Snapchat and Instagram. Someone who realizes that a destination isn’t just a place you go; it’s the sights, sounds, smells, textures, and unique flavors of a region. Much of my work in branding travel and tourism industry clients has been inspired by partnerships with these ideal clients: Visit Finger Lakes, Seneca, Livingston and Cayuga Counties, Bristol Mountain and Roseland Waterpark, The Quiet Place, and more. Partnership goes beyond the clients I work (and develop friendships) with. I’ve also built a strong network of partners I can turn to to provide help at different steps of a project, from mapmakers to copywriters and fellow graphic designers to print shop owners. These partnerships become crucial when I hit stopping points, when I need to get out of my own head, and when there’s simply something that’s better left done by someone else. Knowing I get to work with such equally passionate partners in both my clients and fellow business owners adds a level of fulfillment to my work that simply wouldn’t be possible if I were to hunker down in my cave — no matter how cozy that cave might be — and churn out work regardless of the relationships behind it. Our second source that goes beyond inner validation is exactly what you might think: outside recognition. Taking compliments is something some people are better at than others. I’ve always been on the shier end of the spectrum, grateful for the recognition, but quick to move on to the next thing. Lately, though, I’m realizing just how powerful recognition can be. 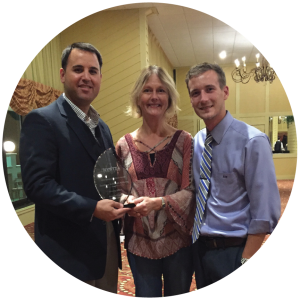 In October, I was delighted to be honored at the New York State Tourism Industry Association (NYSTIA) awards with my client and partner, Seneca County. Seneca County was recognized with the Excellence in Tourism Marketing Award – County Effort, selected from a field of strong nominees from the 62 eligible counties in New York State. The award was given for Seneca County’s 2016 visitor guide, called “Faces and Stories from the Finger Lakes.” It’s a full-color, 50-page brochure that tells the stories of local tourism personalities and businesses found throughout Seneca County, as well as the residents who are proud to call it home. I was honored as part of the award because of my work as the guide’s designer, but naturally it would not have been possible without the partnership and unique skills of the Seneca County staff and volunteers — their storytelling, community building, and trust in me as a designer. On top of that rewarding partnership, was the outside recognition of such a prestigious award nice? Absolutely. It provided that extra layer of validation that both Seneca County and I can use to power our work moving forward. It’s not the first award I’ve been honored to be a part of, but it was a solid reminder of the energy that comes in hearing someone else give confirmation — an energy that keeps us going on days when the going is tough. Should we all work solely for the purpose of outside recognition? Absolutely not. But it sure does deserve a spot in the rewards you experience from doing what you do. No matter the rewards you feel from doing what you do — whether internal or external — it all comes back to gratitude. Inner recognition and outside validation mean very little — and are harder to enjoy — if we do not stop to express our gratitude for what we do. I could not breathe in that energy and exhale my work if I was not infinitely grateful to be able to own my design studio and get out and paint. Now, it’s your turn. Tell me in the comment below: What do you find most rewarding about what you do? What are you most grateful for? Today, I most grateful for completion a Park Planning project we have been working on for several years, and for the partners that made this possible. Cindy, your branding work fit right in with what we were doing. Our consultant used what you developed for the Town of Montezuma to provide us with a plan for wayfinding and educational signs in Montezuma Heritage Park on eleven trails and historic sites located throughout the park. No matter how small or large the organization, you are working with, you give your detailed and personal attention to making the project fit your client’s needs. The gift of your work and talent just keeps on giving. Thank you and Happy Thanksgiving. Congratulations on your well deserved recognition. BEGIN BLAZING YOUR NEW BRAND'S TRAIL TODAY. Book a complimentary Brand Clarity Call and we'll get started.